By Louis Jacobson on Thursday, January 5th, 2017 at 5:00 p.m. The Republican Congress and the incoming Trump administration opened 2017 by trying to decide how -- and how quickly -- to repeal President Barack Obama’s Affordable Care Act. What path lawmakers take on repealing and replacing the law will determine the impact on the American public. Here, we’ll offer a rundown of what the impact could be, based on analyses by independent organizations published in recent months. Put simply, these groups agree that a repeal could lead to increases in the number of newly uninsured Americans, the number of people facing difficulties from pre-existing conditions, the size of the federal deficit, and how much money people will have to pay for their health care. 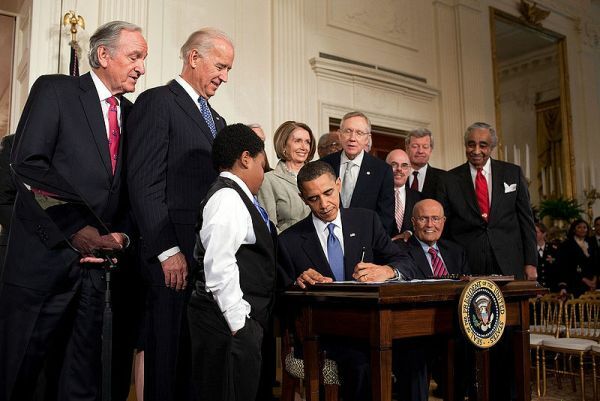 How many more uninsured Americans? There appears to be broad agreement on this number. The major sources of losses would include people no longer able to obtain Medicaid coverage under the law’s expansion, and people who would be unable to afford health insurance without the help of federal subsidies currently provided under the law. In addition, the end of mandates would increase the number of uninsured Americans doing so voluntarily, making the personal calculation that they are young and healthy enough to be able to pay less for their own health care needs a la carte than if they bought an insurance policy. Other groups have come up with similar estimates for the uninsured. This year, the Urban Institute and the Robert Wood Johnson Foundation published a report projecting that 24 million additional people by 2021 would have lost coverage or be unable to find it. The Committee for a Responsible Federal Budget, a group that seeks to lower the federal deficit, projected that the number would be 23 million. Meanwhile, a 2016 study by the Commonwealth Fund and the Rand Corp. calculated that even the most successful replacement scenario produced an increase in 15.6 million uninsured people, while the most pessimistic would lead to an additional 25.1 million uninsured Americans. The Urban Institute study further estimated that 66 percent of those losing coverage would have a high school education or less. How many are at risk due to pre-existing conditions? Prior to passage of the Affordable Care Act, Americans could in many cases be denied coverage from a new insurer if they had a pre-existing condition. The provision requiring insurers to cover everyone is one of the most popular elements of the law. But keeping coverage for people with pre-existing conditions while repealing much of the rest of the law is not so easy. When insurers are forced to add patients with pre-existing conditions to their coverage rolls, it costs money. The law handled this by mandating that even young and healthy people who previously had no insurance obtain coverage. But these mandates for everyone to secure coverage are likely to be repealed since they were among the least popular elements of the law. To stay afloat, insurers might have to quit providing insurance or raise premiums for many or all of the people they insure. The Kaiser Family Foundation projected that if the pre-existing conditions provision is repealed, 52 million Americans could be at risk of being denied coverage in the future. The foundation concluded that in 11 states, at least three of every 10 non-elderly adults would have this type of pre-existing condition: West Virginia, Mississippi, Kentucky, Alabama, Arkansas, Tennessee, Oklahoma, Louisiana, Missouri, Indiana, and Kansas, states that all voted for Trump. What would be the impact for people on Medicare? A full repeal would definitely impact Medicare, the health care program for Americans 65 and over. For instance, a repeal would restore higher payments for services performed under the managed-care portion of Medicare known as Medicare Advantage, according to the Kaiser analysis. This, in turn, would likely lead to increased premiums for people who are signed up for Medicare Advantage. And an end to the law’s guarantees that preventive services be provided free to patients could also raise premiums, out-of-pocket costs, or both. How much more will Americans have to pay out of pocket? According to the Commonwealth Fund-Rand study, the current policyholder who purchased coverage on the marketplace spends, on average, $3,200 out of pocket annually for the premium and for other costs, such as copayments. It found that repealing the law alone without a replacement would increase out-of-pocket costs to $4,700 a year. Some replacement scenarios could produce a larger increase while some could produce a smaller one, the study said. What will be the impact on the federal budget? One might think that repealing a law like the Affordable Care Act would save the federal government money. Actually, in many scenarios, it won’t. That’s because the law doesn’t just spend money -- it also raised revenue through taxes, and it implemented policies designed to keep costs in check. So getting rid of the law also gets rid of the revenue it produced. While it acknowledged some uncertainty, the CBO estimated that over a 10-year period, repealing the law would increase federal budget deficits by $353 billion. A more recent estimate by the Committee for a Responsible Federal Budget mirrored what the CBO found -- $350 billion over 10 years. According to the group’s calculations, the revenue losses would be driven by rolling back tax increases on the wealthy. About half of the $800 billion in revenue losses would come from payroll and investments surtaxes on wages and income above $200,000 -- a tax windfall that very few Americans could take advantage of after a repeal. Another quarter of the revenue losses would come from repealing fees on insurers, medical-device companies and drugmakers.